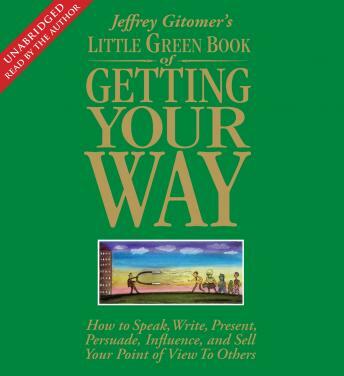 Jeffrey Gitomer's Little Green Book of Getting Your Way digs deep into the 9.5 elements that make persuasion, and getting your way, happen. By breaking down the elements, you will begin to understand, take action, become proficient, and then master the ability to persuade. Because persuasion occurs in so many different areas of life and business, Gitomer leads you from mental readiness to the principles of getting your way and the power that persuasion offers. He challenges you to prepare before you present, to prepare before you try to persuade. He demonstrates how to change a presentation into a performance and shows how this can be done in any environment. Because persuasion most often takes place in business, Gitomer puts special emphasis on the ability to write and sell persuasively. The Little Green Book of Getting Your Way will teach you to harmonize, not manipulate. It will teach you the power of engagement and it will show you how to inject humor into the persuasive process. Jeffrey brings the Benjamin Franklin quote 'If at first you don't succeed, try, try again' to the Gitomer level of 'You only fail when you decide to quit,' and ends by challenging you to think about excellence and eloquence. It will be up to you to take advantage of the opportunity and be the winner you have always wanted to be.